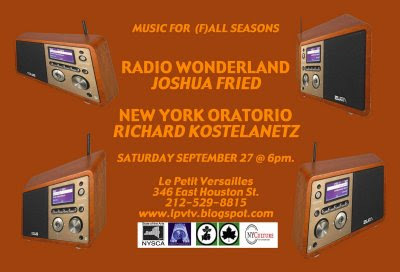 MUSIC FOr (F)ALL SEASONS | Allied Productions, Inc.
Richard Kostelanetz in person at 8pm. Come enjoy the garden earlier as we will present New York City Oratorio twice @ 3pm & 8pm. Admission is FREE but donations help provide food & refreshments! drummer) and a steering wheel (I’m a, er, wheel player). RADIO WONDERLAND turns live commercial FM radio into recombinant funk. All the sounds originate from an old boombox, playing radio LIVE. to the original radio source. to morph a bit of radio in the direction of a kick drum. Fall of an Artists? Colony (Routledge, 2003). as exceeded the capacities of either authors? city as a wholly unprecedented environment. fertile and challenging subjects for art. Additional support, in part, by public funds from the NYC Department of Cultural Affairs. Isle of Klezbos! Klezmer for Kweens!